It was just another day on February 26 until 15:26, when Train 92 derailed west of Toronto resulting in the tragic death of three VIA Rail locomotive engineers. In my own 32-year career in Canada's railways, I have never experienced so much pain and sadness and, like my colleagues, so much helplessness in a position of so much authority. It was just another day, on February 26, when more than 15,000 people traveled on 51 trains all over Canada. It was just another day of travelling from or to work, schools or to see associates, families, and friends. 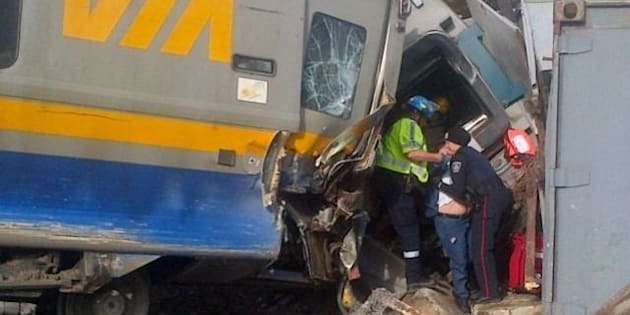 Just another day until 15:26 when Train 92 derailed west of Toronto --resulting in the tragic death of three VIA Rail locomotive engineers: Ken Simmonds, Peter Snarr, and Patrick Robinson. Of the 71 passengers on-board, 45 were transported to five local hospitals where five are still admitted and receiving care. As my colleague John Marginson, our Chief Operating Officer said, "VIA Rail is a relatively small company but we are a big family." As its President & CEO, I lead a team of executives who together influence many things, make many decisions, and are entrusted with the authority to manage the corporation's affairs and ensure it provides Canadians with safe, reliable inter-city train transportation. On that day, at that moment, we all shared a deep sense of helplessness over an event with such tragic consequences for members of the entire VIA Rail family, our passengers, and their families. Looking back to that moment and the hours since, I realize that although we may feel helpless in the face of such adversity, it is what we do next that defines us. May it also be what best honours those who lost their lives. From the VIA Rail team on-board and other passengers who assisted the injured; the emergency personnel and members of the public who rushed to the scene to offer assistance; VIA Rail off-duty workers who came in to attend at hospitals, provide information to injured passengers and families; our railway partners and business associates, suppliers, customers, and other well-wishers who took the time to write or post comments online and express their sympathy for our loss and offer prayers for the families of the victims. All demonstrated through their actions, the strength, courage, kindness, and compassion that in many ways, best describe our three fallen colleagues. All who have worked with them have witnessed these qualities in each of them. They were spouses and fathers, family and community members, and they were proud VIA Rail locomotive engineers. Our prayers and thoughts are with their families and loved ones. In my own 32-year career in Canada's railways, I have never experienced so much pain and sadness and, like my colleagues, so much helplessness in a position of so much authority. But I know we will all remember that day, Sunday February 26, 2012, and as we move forward, the memory of these events will sustain our continued efforts and commitment to safety of train travel for our passengers, our employees, and all Canadians. For that is the best way to honour the memory of Ken, Peter and Patrick.